The audio excerpts on our site are available in three different audio formats — MP3, Windows Media Audio, and RealAudio — to enable as many visitors as possible to be able to listen to these clips. It intentionally looks like a physical player, so you shouldn't have much problem locating it, or figuring out how to use it. Press the "Play" button (rightward pointing triangle) to start playing, or to re-start after pausing. Press the "Pause" button (two vertical bars) to pause playing. You can adjust the volume by pressing the volume control at the right end of the player, and sliding the volume right (higher) or left (lower). You can also start the clip in the middle (at the point of your choosing) or "fast forward" (or reverse) by pressing the spot of your choosing in the purple "progress bar". If you have a dial-up Internet connection or a slow broadband connection, it can take a little time for the audio clip to play after you press the play button. Click the Windows Media Listen link. 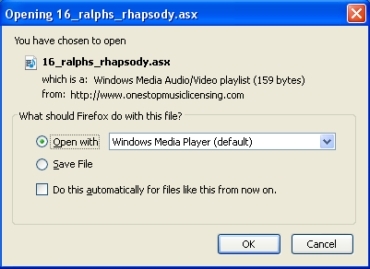 In the simplest case, a separate Windows Media Player window will immediately open and start playing the clip. Make sure "Open with" is set to "Windows Media Player". Then press "OK". A Windows Media Player window will open and start playing the clip. Press "Open". A Windows Media Player window will open and start playing the clip. Go to the "Get Windows Media Player" page. Follow the instructions for downloading and installing Windows Media Player. Click the RealPlayer Listen link. 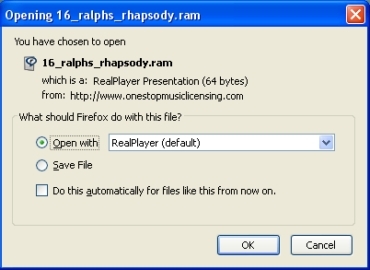 In the simplest case, a separate RealPlayer window will immediately open and start playing the clip. Make sure "Open with" is set to "RealPlayer". Then press "OK". A RealPlayer window will open and start playing the clip. Press "Open". A RealPlayer window will open and start playing the clip. When the download is complete, run the installer. In Internet Explorer, you can just press the "Run" button that appears. In Google Chrome, the download will appear at the bottom of the browser; click it, and then press the "Run" button. In Firefox, the download will be displayed in the "Downloads" window. Double-click on it, and then press "OK" (when it asks you if you want to execute the installer program). In Safari, you will be asked even before you download whether you want to run the installer program — press "Run". Follow the on-screen instructions to install RealPlayer. or comments regarding this web site.